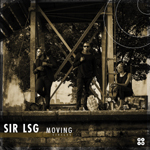 South African House Music artist Sir LSG debuts his first album, a stunningly crafted piece of art for which he pulled together an impressive collective of international vocalists, musicians and collaborators. Titled ‘Moving Circles’, the longplayer represents the concept of life seen as a journey. It highlights events of love, life, inspiration, sadness and loneliness in one big turn. Just as there's a start and an end to everything, the musical journey begins with 'Departure' and takes you through different walks of life, before getting to 'Arrival'. While South Africa has been at the forefront of a global House Music revival for many years now, Sir LSG has been tipped of as the “one to watch” inter alia - leading industry US download-store Traxsource put him in their Top 20 African House producers of the year in 2014. Since his first single release in 2011, LSG has perfected his magical soulful and jazzy, yet clearly afro-influenced sound, now culminating in this well rounded long-player, which took him four years to complete. 'Moving Circles' features renowned crooners like Germany’s Clara Hill, Chicago’s Carla Prather, UK’s Joseph Junior, South Africa’s new RandB sensation Ayanda Jiya and established musician Zano, all of whom sound their best and complement the beautifully crafted grooves and soundscapes. Co-produced by one of South Africa's fast-growing piano players, Thandi Ntuli, and one can feel that more first-league jazz musicians enjoyed contributing to Sir LSG’s tunes.